Frequently Asked Questions: Why Choose Jason Scott Photography? 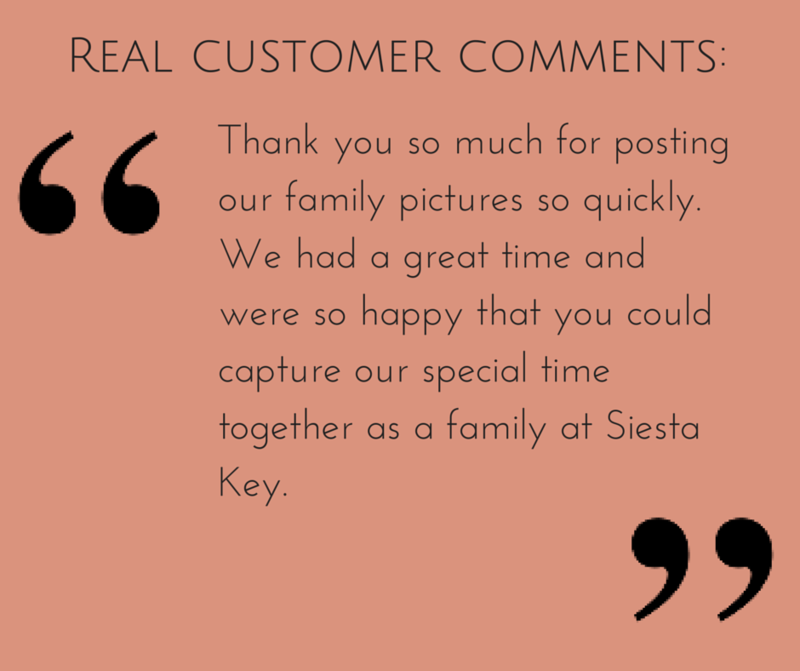 Wondering why you should select Jason Scott Photography as your photographer for your family portraits on Siesta Key, Longboat Key, or Anna Maria Island? During our busy season (March through July), we are out on the beach almost every night, capturing memories for families on vacation. We know how to pose large and small groups, make kids (and adults) smile and look at the camera, and set a steady pace for your beach portrait session so that you receive as many photos as possible while still having a great time! Our customers tell us all the time how much fun they had at their session. We're sure you will too! We post your photos online within 2-3 days of your session! (Yes, really!) You can view them on a computer, tablet, or smart phone while still on vacation, then again when you are at home. You can easily share them with your friends and family on social media or via email. But... We don't put an expiration date on your gallery. You can wait as long as you want to order prints or digital downloads. And you can do all of this from the comfort of your own home. We'll give your order the attention it deserves, no matter how long you wait. We're available via email, text message, phone, or social media whenever you need us. Additionally, we try to give you as much information as possible directly on our website. We're not hiding our prices or any other details. We want you to know the answers to all of your questions as soon as you have them so you can make good decisions about booking your session, what to wear, where and when to meet, and how to order photos after your session. Our customers tell us all the time how much they appreciate our quick responses to emails! We're not hiding our prices. We don't want you to waste your time trying to figure out how much things cost. Everything is listed directly on our website. Even though we know there are lots of other photographers in the area offering beach portrait sessions for $49 or $99, we feel our $285 family beach portrait is a great deal because of the quality of our photos and the fact that you'll save on prints and wall art afterwards. We don't mark up our print prices as much as most other photographers and we offer digital files for reasonable prices as well. We're up front about our print and digital download prices from the moment you first reach out to us about a portrait session - no surprises! Without going into all of the technical details... we use the right camera, lenses, lighting, and a full time assistant to make sure our photos are great, every time! Jason's photos look great, straight out of the camera. (That's a big reason why we are able to offer such a fast turnaround time.) With very little tweaking of the lighting and white balance, the photos we post in your online gallery are close to perfect. When you order prints, we use a professional retouching service to make all the fine details of your photos look just right. No more stray hairs, shiny skin, etc. Your prints and wall art will look amazing! View our samples here to see what we mean. Ready to book? Fill out our contact form to get started! More questions? Check out our Beach Portrait FAQ.